Being a first-type, desert peak lead for the local chapter, I secured three loyal and ready participants for this long drive and climbs in the East Mojave and eastern Death Valley region. Being the only major park, or point of interest, that was shown on the maps of that time, we wanted to pay a visit, and climb Edgar Peak (7,162'), otherwise known then as Providence Mountain. 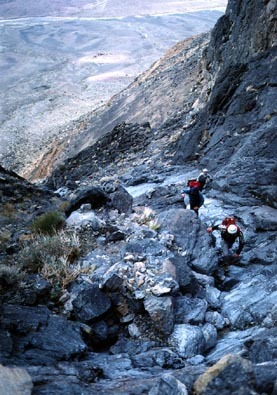 I had a diminished opinion of desert peak climbing then, thinking they would be nothing compared to a big Sierra peak. We agreed to meet at the Providence Mountains/Mitchell Caverns State Park, which is some one hundred miles east of Barstow, CA, along Interstate 40. I left town early, and it required us, then, to complete about an eleven hour drive to get there. That includes some stops. We pulled in early. After taking a ranger-led tour of the Mitchell Caverns, we enjoyed a beautiful desert sunset. Having managed to hike the short nature trail, too, beforehand, we had observed quite the fine specimens of cacti and shrubs. Thanks to two of the participants, we enjoyed a fine Thanksgiving feast, with turkey and all the trimmings, in their outfitted van. The next morning, we started early on the nature trail. Going on the short trail as far as it went, we then headed cross-country up a steep, likely-looking canyon. By the map, it seemed to head for the summit. The top of the mountain had been in a cloud since we had arrived, so we couldn't visually "make" our route. The clouds remained on the top as we climbed up, so we had poor visual ability to make a determination as to the location of the highpoint. No GPS units back then! As we climbed higher, we came into the clouds. Snow was plastered on the oaks, and pinyon pine branches, making an unusual sight. It became colder, and I began to have doubts about going further. The other three wanted the peak, but headed in the wrong direction. I was unable to sight landmarks, so had not the data to override their choice of direction. They reported coming to a steep move, with ice on the rock. They felt that if they could just make that one precarious move, the rest of the way would be easy. We figured by our altitude that the summit was close. I didn't bring a rope, since the peak was rated class 2. Luckily, they weren't good rock climbers, so due to the difficulty, as well as the uncertainty, they turned back. I was extremely worried about our time. The days were so short, I ordered, as best as I could, a turn-around to give us enough time to make the descent. The nights would be cold, so I feared a forced bivouac due to darkness. This retreat was a bitter pill. We had driven so far, and made such an effort. As we regrettably headed down, the clouds lifted. We seemed to think that the summit was to the far left, not right, as the three were trying to climb. It was a good call to turn back from that. Injury or death resulting from poor route-finding is a peak climber's nightmare. A small reward was the clearing view to the south. 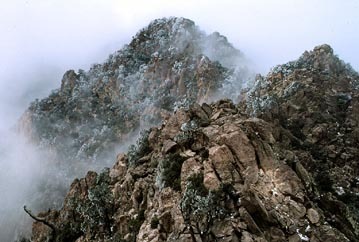 I was to finally climb this peak, along with adjacent Mitchell Peak, in November, 1986. And then both again, in November, 2002. The Desert Peaks Section has some very experienced leaders who know the route from their own multiple ascents. The navigation is tricky, and it would have taken good guessing as to the best way. We came back to our cars in daylight and enjoyed another fine sunset. We then drove, in the night, northward on part dirt, soon-to-be-named Kelbaker Road, through the now East Mojave Preserve, to Baker, CA, and then north on Highway 127. The weather wasn't forecast to be really great, so I chose to get an almost sure thing in a repeat ascent. For me, this was Eagle Mountain #2 to the north. The gain on this peak is only about 1,800 feet, with only a few miles total to hike and climb. We could have a quicker retreat if the weather broke loose. After a pleasant, early breakfast in the tiny desert town of Shoshone, CA, we drove north on Highway 127 about fifteen miles to some roadside parking. Eagle Mountain #2 is an impressive, lone, sentinel, standing by itself. I was to see this mountain first in 1978, not knowing its name, but taking a photo even back then. Now, a short dirt road leads off the paved highway for the purposes of parking vehicles. We hiked up toward the peak across the sloping playa, having to first cross the Amargosa River. That was a rock-hop. There are route-finding problems, so I was careful to try to mark our route with ducks, or piled rocks. These were all kicked down on our descent. Some people will leave orange peels, or even try to use string to avoid getting lost. Don't do any of that. Peak climbers will have a good eye for ducks. I followed a series of ducks to ascend this peak route, solo, my first time. I led up the rock sections I remembered, and cautioned the others about desert climbing. The rocks are brittle and sharp. One climber bled profusely on a later trip, after cutting a finger. I put up lots of ducks as I waited for the others. There were some class 3 sections mid way up, and one person didn't have much climbing experience. I urged care and slow moves, to allow for thought on how to place hands and feet. Finally, we were on the summit ridge. The sight of the top, a large crag, sent a chill through me my first time. It looks too dangerous. I knew where to go, and that it wasn't that hard, so the others followed on faith. It was cold and windy, then we came to the class 3 part. One has to straddle an exposed rock rib for about thirty feet. There isn't much room for error. Also, going up might be O.K., but one has to downclimb as well. Summitting together, we celebrated one peak ascent. I took pictures, and we signed in the register. One other person climbed up from another route, surprising us. He said that there was an easy route the way that he had come. "A trail," he spoke. We didn't know him, so opted to go back our own way. I have since climbed the other route, twice, and find it easier. But we really had the superior challenge the way we had chosen today. Following our ascent route almost step for step, we slowly descended the mountain. I had to stop to look for my ducks at several points. There is a key break in the cliffs, that was absolutely mandatory to find. I navigated correctly, and took us down the same gully, and then to the flatter desert playa. Success! No injury or problem! We came back to the cars after a five or six hour round trip. The forecast was for poorer weather, so we left to head for home. I chose to head south on Highway 127, passing some scenic dunes. A beautifully strange sunset lit up the far clouds. I stopped for pictures. It was like a cosmic vortex! Rain hit us hard as we drove, at night, along Highway 58, west of Barstow. Trucks passing us sent up huge sprays of water. Some local chapter people have said it never rains in the desert. Watch out for "outings experts!" I recall we secured a motel room in Mojave, to awake to fresh snow on the Tehachapis. Puffy clouds and blue skies marked our drive north on Interstate 5. Being a Thanksgiving holiday weekend, this was preferable to being stuck at home. The four days allow for a more productive time, climbing and hiking. With cars nowadays, a well maintained vehicle can easily handle the miles without breakdowns. Fuel efficiency reduces the costs of gas. The now higher speed limit on the Interstates expedites the time and effort traveling, and there are plenty of nice services along so many exits, making it a pleasure to stop. 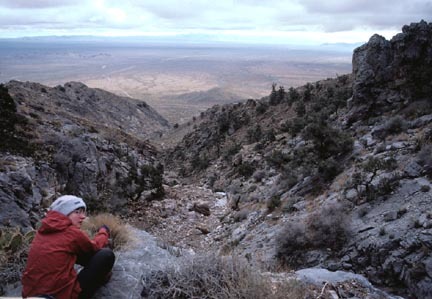 The 1994 California desert wilderness bill was certainly well timed, with the increased use and interest in what so many previously called "wasteland." So many climbers and hikers love the desert, now. I will always try to visit, enjoy, and appreciate it, as long as global warming concerns don't override all of this. I would probably take a long bicycle ride to get there, provided I had the time and money. It will be tragic to learn so much about the desert, then be prevented from enjoying it by the wasteful habits of others. A big, belated, thanks to the local chapter for initially allowing this great exploration effort for those that chose to meet the challenge!